PYAD is a value and dividend income strategy devised by UK investor and writer, Stephen Bland. It focuses on finding value stocks with relatively high yields and no debt. PYAD is the acronym for the strategy's four filters, which include the Price to Earnings ratio, Yield, Assets (Price to Book Value) and Debt. Specifically, the strategy looks for companies with a Price to Earnings ratio of two-thirds that of the market and a Yield that is 50% above the market average. 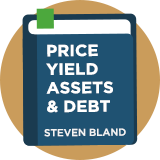 Stephen Bland says: "My principal aim in this was firstly to minimise the downside before I considered any trading upside to a share. I knew it wouldn't work in every case, there was bound to be the odd failure, but I reckoned that overall it would perform well. I was right and it did, producing handsome returns over the years." The PYAD strategy became well followed by Motley Fool readers. Renowned UK investment writer. Focuses on value and dividend strategies. This screen was inspired by the work of Stephen Bland of TMF (he also writes for MoneyWeek).